Dogs can also be victims of medical emergencies. But it’s totally the owner who is responsible for ensuring that their pet gets proper medical care. 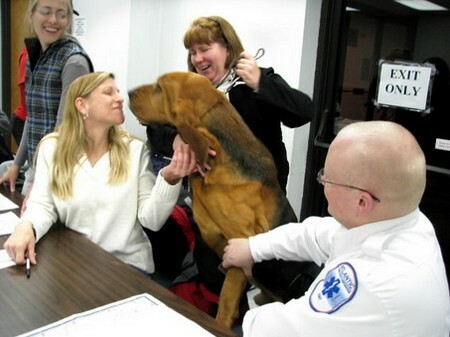 Owners’ should be completely aware of their dog’s medical history for sometimes it is hard to recognize an emergency. If you look after you dog on a daily basis and give attention to it, you’ll surely get to know many symptoms of an emergency. Another important action is to get routine checkups of your dog. It’s a dog owner’s responsibility to take his dog for routine checkups just to familiarize himself about his dog by touching it in some particular areas and studying his reactions for the same. Some medical emergencies need lots of care and a fast result. The owners will need to ensure that all medical phone numbers are handy and easy to locate, for it could be a question of life and death. You need to know each and everything about your dog, like an assessment of its medical information. Have you ever noticed how your dog lies down beside you? This is because your dog is not getting proper food and is not eating up properly. If there is vomiting, then you must check his stomach area to see any swelling or signs of tenderness. Check by pressing gently over the area where the dog’s belly is. If something’s wrong then your dog will whine instantly. Have a vet examine him in such cases. It is very obvious when sometimes your dog has a broken bone. The dog in such a case won’t be able to walk properly, won’t be able to play anymore. You may even notice the dog’s bone protruding out of his coat or fur. Severe pain may result into shortness of breath, which could be dangerous. It usually means deficiency of oxygen in your dog’s body and is a big emergency. In such a case, you must visit the nearest vet hospital for treatment. It could be a sign of a grave emergency. If in case your dog has had a car accident, it may be dangerous as most of the dogs don’t show symptoms immediately. Signs of internal damage are invisible to the eye. Therefore, the best option is to rush them to the vet to avoid any emergency. Another major concern among owners of dogs is immense uncontrollable bleeding. In case you notice any abnormal bleeding that appears in your dog or is unstoppable, seek emergency treatment really soon. Unstoppable bleeding can be deathly fatal and must be taken as a very serious emergency. It should be an owner’s responsibility to take care of his dog in a proper way especially during emergencies and to go for routine check ups to avoid the same.